1. Wound Response: Projects in this area aim to discover how animals detect wounds and how signals from the wound launch the subsequent processes that accomplish regeneration of missing tissues. 2. Stem Cell Regulation: The regeneration of new tissue requires the proliferation of stem cells. The two model organisms studied in the lab both have a population of adult pluripotent stem cells that provide the material for new tissue. Thus, these species are great models for studying the regulation of pluripotency of stem cells in vivo. Projects in this area aim to uncover how the proliferation, differentiation, and renewal of stem cells are controlled in the context of regeneration. Wound repair and regeneration are fundamental features of animal multicellularity. Therefore, it is possible that regenerative mechanisms are conserved across animal evolution. Acoels are likely to be the earliest lineage of animals with bilateral symmetry (bilaterians), and are therefore phylogenetically well-placed to inform questions about the evolution of regenerative mechanisms. We have developed the three-banded panther worm, Hofstenia miamia, as a new model acoel species for studies of regeneration. Studies of Wnt and Bmp signaling pathways in Hofstenia regeneration revealed that the mechanisms for patterning new tissue along the anterior-posterior and dorsal-ventral axes are conserved between acoels and planarians, a bilaterian lineage that is distantly related to acoels. This finding raises the possibility that highly conserved molecular genetic processes could underlie other aspects of regeneration, such as the regulation of stem cell differentiation or renewal. We are taking an integrative approach for studying regeneration in an evolutionary framework by using a broad range of techniques including transcriptional profiling and lineage tracing in acoels and planarians. These studies will complement those in other regenerative systems and enable us to identify conserved mechanisms. Because essential components of a process tend to be conserved over the course of evolution, identifying regenerative pathways shared by many species would be a powerful method to uncover as yet unknown regulators of regeneration. Hofstenia presents many advantages as a model regenerative species: adult Hofstenia regenerate robustly, adult tissues and structures can be visualized via in situ hybridization, RNAi can be administered by injection or by soaking in dsRNA, and stem cells can be isolated by FACS. Hofstenia also produces accessible embryos that enable comparisons of regeneration and development, and provide a unique opportunity to use gene-delivery and genome-editing tools to study regeneration. 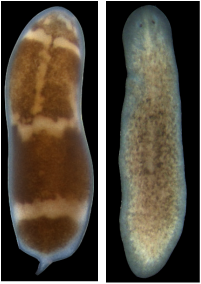 With the capacity to replace virtually all missing tissues, a sequenced genome, and RNAi tools for studying gene function, the planarian Schmidtea mediterranea has become a model system for uncovering genes involved in the process of regeneration. Studies of this model will complement those in Hofstenia to identify conserved or independently-evolved regenerative mechanisms.